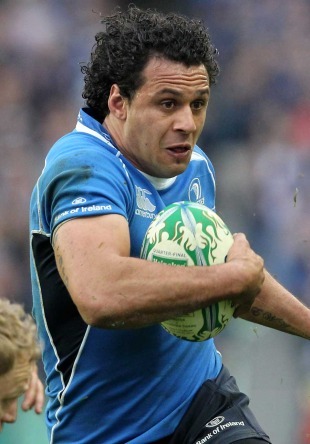 Leinster star Isa Nacewa has been rewarded for a stand out season with the Irish Rugby Union Players' Association Players' Player of the Year award. The Auckland-born Fijian international, who edged out provincial team-mate Sean O'Brien and Munster's Keith Earls for the award, is the first overseas player to claim the honour that he collected in Dublin on Wednesday night. "This is the first time I've received an award in any country which has been voted for by my peers and I am overwhelmed to be honest that the other players in Ireland have chosen me," commented the 28-year-old Nacewa. "I'd like to thank all my team-mates in Leinster who have made my job a lot easier". Connacht's Fionn Carr was also among those recognised when he was awarded the Try of the Year award for his 70 yard effort away to the Scarlets. Ulster's Nevin Spence picked up the Young Player of the Year gong while Leinster's Richardt Strauss collected the Unsung Hero award. Elsewhere, Leinster stalwart Malcolm O'Kelly was inducted into the IRUPA Hall of Fame while O'Brien was named Supporters' Player of the Year. The Rugby Moment of the Year was also announced with Ireland captain Brian O'Driscoll taking home the award for his record breaking try against England to break the Six Nations Championship try scoring record which stood for 78 years.